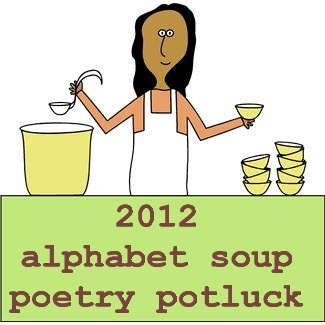 #20 in the Poetry Potluck Series, celebrating National Poetry Month 2012. Okay, Cutie Pies — Do you know what day it is??!!! Maybe I should say: What are you carrying in your pocket today? I hope that along with a ripe mango, biscuit crumbs, 3 cabbage leaves, 2 chipotle peppers, a handful of lentils, apricot rugelach, 2 cups of oatmeal, 5 blueberry muffins, orzo, almonds and pecans, a bunch of grapes, plain yogurt, shrimpies, a carrot cupcake, wild asparagus, two frozen pie crusts, and a lamb who speaks Irish — there is at least one POEM! Walla Walla Bing Bang, it’s Poem in Your Pocket Day! — The one day of the year you’re supposed to carry around a favorite poem, stop perfect strangers in the street and read it to them (with feeling). Or maybe impress the person behind you in the grocery checkout line with a little Billy Collins while you’re juggling a few cantaloupes. WHAT DO YOU MEAN YOU’RE NOT CARRYING A POEM?! Sheesh! Have you learned nothing this month? It’s a GOOD THING Lill Pluta is joining the Potluck today, because she has the perfect poem for those of you with empty pockets. Yes, I know that I listed Lill as “Kay Pluta” in the Potluck Menu. That’s because Ms. Pluta goes by a few different names — sometimes it’s “Lillian Pluta,” other times, it’s “Kay Pluta,” and today it’s “Lill Pluta.” You’re allowed to have different names when you’re that awesome. A few years ago, I picked up Lill on my internet radar. She had a blog/website called “Rumpled Words.” I tend to like my writers wrinkly and rumpled, so I followed her shenanigans as closely as I could. I learned she was a Cat Wrangler, so I invited her to our National Cat Day celebration (you can see Blitzen, Shado and Ebo here). And she once won a “rather hefty prize” for writing a poem about mustard — hot dog, she’s my kind of poet! These days, she’s living the good life on the south Texas shore, where she’s continuing to “make metaphors out of molehills.” I don’t think she’s rumpled any more (oh, the irony), but she’s got us covered with a great poem for you to carry around all day today, and a delicious edible pocket to boot. Lill: “Lillian’s Pocket” was first published in Thema Literary Journal, vol. 22, no. 1, Spring 2010. I had long admired this theme based literary magazine and just HAD to submit when they featured back to back themes using my first and middle names. My poem submitted for the “In Kay’s Kitchen” issue was not accepted (although it came close), but my entry for “Put It In Your Pocket, Lillian,” was. The first line of the poem came rather quickly, but I discarded it as being totally absurd. After noodling around with other verses, I grew frustrated that the poem was going nowhere and pulled out my initial brainstorming notes. That first line struck me in a totally different way. So remember, never throw lines away even if you think they are totally batty. To learn more about Thema go here. a note that starts off Love . . .
and let them loose at dark. There are no bats in pockets. They’re folded in your heart. Copyright 2010 Lill Pluta. All rights reserved. Living in a warm climate, I seldom wear sweaters or jackets, but I do still have a long black woolen coat from my Nebraska years. This photo is a combo of things extracted from various pockets, yet is still typical of what I might be toting around with me at any given time. I am a mom to boys, and although they are in their teen years, I’m often left with various bits and pieces. Here you will see crumpled coupons, a mechanical pencil, a flag lapel pin, Sponge Bob candy, a wadded up straw paper, a leaf, a shell, a tag, a hair clip, a receipt from the rock shop, and twelve cents. I’ve always loved pockets. When my mother was making my wedding dress, I begged her to sew pockets into the seams, but she refused. Faux pockets, those little fake you out flaps they sew on jackets, freak me out. That’s akin to painting fake windows on walls. As you might imagine, I am fond of pita pocket sandwiches. One of my favorite combos includes, spinach, radicchio, arugula, swiss cheese, sliced almonds, cranberries, and vinaigrette. Sometimes I like to add spiced deli meat such as pastrami or Cajun roast beef. Lill Pluta grew up in Georgia, went to college at Flannery O’Connor’s alma mater, which is now known as Georgia College and State University. After several years of teaching middle school kids about prepositions and participles, she left the educational world to follow her Air force husband across the country. Along the way, she collected a small herd of cats, two clever sons, and lots of happy, sad, funny bits that find their way into her stories. Having long dreamed of living by the ocean, she’s happy that they’ve finally put down roots along the Coastal Bend of Texas. Her publication credits include a picture book, a series of rhyming board books, and over a hundred short pieces for the magazine and educational market. Her first love is writing spunky imaginative tales aimed for 9-12 year olds. She’s currently working on a historical middle grade novel with a magical twist. Lill is a member of the group blog, From the Mixed Up Files of Middle Grade Authors. You can also find her online at her official website and personal LiveJournal blog. Previously: Menu/Giveaway/Door Prizes, April Pulley Sayre, Mary Quattlebaum, Helen Frost, Linda Ashman, Gail Gerwin, Martha Calderaro, Kathi Appelt, Robyn Hood Black, Charles Waters, Adele Kenny, Linda Baie, Lesa Medley, Leslie Muir, Margarita Engle, Sondra Gash, Doraine Bennett, Janet Wong, Jill Corcoran. < Previous jill corcoran: dreaming of big things . . . and cupcakes! I’ve recently given coats away, and been amused at the things I find in the pockets. Train tickets, small change, bookmarks, event tickets, folded napkins, hard candies, small balls of yarn… I love that Lil has a leaf. That makes perfect sense to me. As does her poem. It grows on the reader in the re-reading. It’s wonderful. You’ve got pretty big pockets for all those things! Small balls of yarn?! I often have pennies in mine, that I’ve picked up from the ground. About 5 years ago, Len and I started to pick up every coin we found, saving it in a tin bank. Before we go to Hawaii each year, we convert the change to paper money to give to our niece and nephew. We’ve literally found hundreds of dollars this way! It’s kind of fun, proving that little things do add up. Oh, I like this–so poignant, and such a great metaphor! It’s a wonderful poem. I like “keep your dreams from daylight” and “caves for memories to roost in.” It’s especially poignant for mothers who keep their children’s treasures in their pockets :). I’ve just printed off this poem to be the one I carry around today – it’s already snug in my pocket! (Even though I’ll be home writing in the face of a deadline rather than out and about.) Thank you, Lill, and of course, Jama, for such a fulsome post! And I quite enjoyed the image of a pocket-full of those cumulative ingredients from the Potluck thus far…. Glad you have Lill’s poem in your pocket today, Robyn. It’s also nice to have a potluck pocket full of goodies from you and all the other guest poets this month :). Glad you enjoyed the post, Leslie. The shrimpies are having fun with those other ingredients in my pocket. Love the pocket poem! What a super poem to post today. Lill is right about not throwing lines away. Sometimes our original idea/instinct when writing a poem is the best one. Happy Poem in Your Pocket Day, Elaine! I so love how the tidbits, fragments, and little snippets come together in this post to enchant and captivate your readers yet again, dear Jama and Lill. I can just imagine drawing out a string of glittery words, squiggly lines, and colorful phrases from my pocket. Beautiful! What a lovely thought, Myra! How wonderful to carry a string of glittery words, squiggly lines and colorful phrases in your pocket :)! I don’t know if I told you but I keep printed poems by my bed to read before I sleep. There used to be 3: IF by Rudyard Kipling, The Journey by Mary Oliver, and Praise Me or Curse Me by Aaron Zeitlin. Since your poetry potluck, i’ve since added Awake by Helen Frost, The Words of Change by Lesa Medley, and now Lillian’s Pocket! I’m going to have a huge stack soon! 🙂 (Not that I haven’t loved the other poems too, but some just speak more loudly to my heart – it’s all personal, yes?) Thank you for this, and thank you to all your participlating poets! It makes me so happy to hear that you keep poems by your beside, Debbi, and that you’ve added several by the potluck poets! Most definitely, different poems resonate with each of us more than others, and the same poems resonate more at different times of our lives. They’re all out there, ours for the choosing. There’ll be a kitty poem on Monday that Trixie might like :). I’m always astonished by what comes out of my two boys’ pockets when I do the laundry — pennies, small toys, lego heads and hands, paperclips, mini airplanes made out of post-its, rubber bands, acorns, leaves, and lots and lots of rocks. So I really love the pocket poem for Poem in your Pocket day. Wow, your boys are quite the collectors, Katya :)! “Lego heads and hands” made me smile. You’d think all those rocks would get heavy after awhile . . . I think a pocket in a wedding dress makes perfect sense, to dry the tears perhaps, to store a few breath mints? I love that you made sense of that first line, such good advice, & now your poem makes perfect sense, but of course you know that. Beautiful, & now that it’s almost lunch time, I wish I had some pita pickets. Thanks Lill & Jama for a big smile on Poetry Pocket Day. After reading Lill’s poem, I bought some pita pockets. So that’s what I’m having for lunch today — after I read her poem again, of course :). I carried a tiny white purse with the earrings inside. What a lovely gesture, Barb! Thanks for having me here, Jama. I am quite honored. I’ve enjoyed reading all the comments as well. So glad you joined us this year, Lill! Thanks for sharing your cool poem :). I’m not a fan of faux pockets either, but I am a fan of Lill’s poem today — thanks! Yay! Glad you liked Lill’s poem, Martha :).